The SS American Victory Mariners Memorial & Museum Ship was a "good will ambassador" for the United States during World War II. It was manned by the U.S. Merchant Marine and defended by an all-volunteer group of U.S. Navy sailors called the Navy Armed Guard. This ship used to supply food, vehicles, machinery, and supplies to war ravaged areas of Europe and the Near East, for the US Government's United Nations Relief and Rehabilitation Admin. 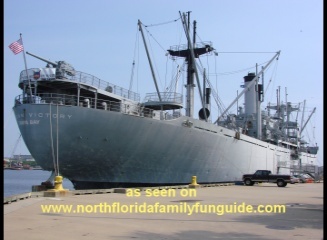 This ship was one of 534 Victory ships build between 1944 and 1946 to replace the Liberty class of merchant vessels. It is 455 ft. in length, and 62 ft. wide, going a top speed of 17 knots, faster than it's predecessor, the SS Liberty. Today, she lives at Channelside in Tampa, Florida, offering daily tours for families and groups to walk the decks and see how the sailors, soldiers, and airmen lived here during WWII. They have some very nice displays on the dangers that merchant vessels encountered on the seas, such as pirate flag identification and information wall. They also have a knot making challenge activity, and a video presentation on the history of the SS Victory. This tour offers a hands on approach to history in a way that kids can understand. It also is a living memorial to all of us by keeping alive the legacy of the maritime industry, and honoring the men and women who built, and sailed this vessel, risking their lives to provide necessary equipment and food to those who needed it during peace and war. The museum is looking for a few good men and women to help in several areas of the ships operations. Mariners with current United States Coast Guard licenses and ratings are especially encouraged to volunteer. The museum has special events throughout the year, notably the annual Family Funfest on the 4th of July, which offers lots of family fun and food, contests and prizes, and the best fireworks seating at Channelside. They have a Ship Store that offers educational and historical mementos, and memorabilia, and other sea related merchandise. This ship is available for cruises and private events.